As of March 2017 this post is no longer relevant. 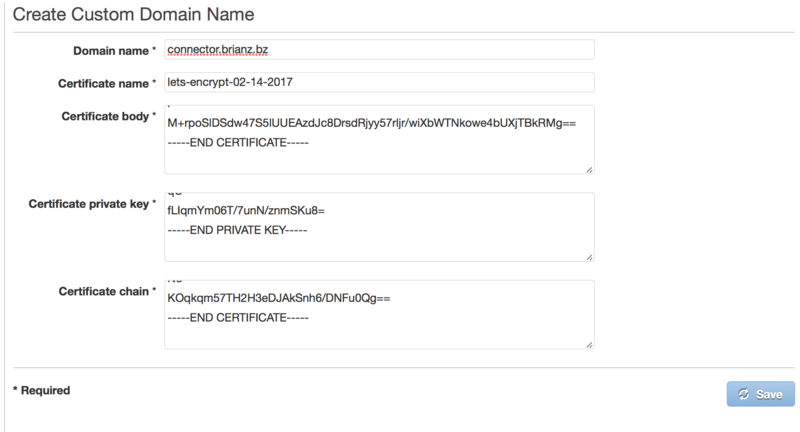 AWS has updated API Gateway so that you can get a free certificate using AWS Certificate Manager. I’m leaving this up for historical purposes but if you need SSL for API Gateway on your own domain please have a look at the Certificate Manager integration…it’s quite easy! If you’re reading this blog it will become very obvious I’m a big fan of the Serverless framework to power AWS Lambda and API Gateway integration. In this post I’ll use my Dilbert Slack plugin which I built in a prior post (and which I’m still running on a few different Slack channels). What we’ll do is set up a custom domain with SSL so that https://dilbert.brianz.bz works just the same as the default API Gateway URL. What is even better…we’ll do this for FREE using a completely legitimate certificate authority so that our certs don’t raise any warnings for users. Because we’re going to be doing this with open source software there are a few hoops to jump through…but not that many. If you feel like shelling out a few hundred dollars to buy a domain from a certificate authority the process would be super simple…but that’s no fun. This process is simple enough that I don’t know why anyone shells out the money for an SSL cert these days (unless you need a wildcard domain…more about that in at the end of this post). The secret sauce in getting a free SSL certificate is certbot from the Electric Frontier Foundation. To be clear, there are definitely other ways to accomplish this. This is actually my second iteration of this process which is easier than my first implementation. For my purposes I’ve found this process to be quite easy and painless. One caveat with certbot certificates is that they expire after only three months. This process is so simple I don’t think it’s a big deal to do it four times a year. Sure…if you’re managing dozens of domains it could get cumbersome, but for a handful of domains it’s not a huge deal. certbot has many different options and methods for validating that you own the domain for which you’re requesting a domain. I have found that the easiest validation method is via DNS. Other challenge methods require running an HTTP server on some publicly accessible host. This used to be the method I used where I’d spin up a nano EC2 instance, run a simple HTTPServer via Python and have it serve a some file in response to the HTTP request from certbot. 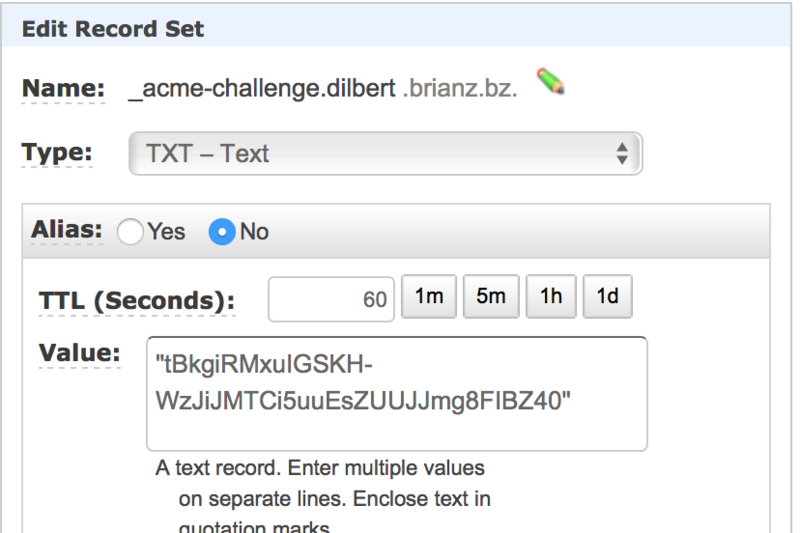 The DNS challenge is much simpler…all it requires is adding an TXT record without the need to run any additional systems or software. Note: Here I’m creating a local directory names letsencrypt and mounting in into the container as /etc/letsencrypt. The reason for that is because certbot will place all of the created certificates into /etc/letsencrypt. We want any created files to persist on our local system after the container has been removed. certbot has tight integration with Nginx, Apache and other webservers. However, I have found these to be more trouble than they are worth since they will actually attempt to write over your config files or expect your webserver to be able to serve static content from a path which looks like /.well-known/acme-challenge/fhKqLc6FuM97zg3. What I have found to be super easy is the --manual method which we’ll use here. Nice! Again, you’ll notice that certbot put the keys in /etc/letsencrypt. If you’re using Docker like I am these will now be sitting on your host system. It’s now safe to kill the container. First up, navigate to the API Gateway console and click on “Custom Domain Names” followed by the “Create” button. Once you’ve clicked the Save button it’s time to point this domain at a particular API and stage. point dilbert.brianz.bz/api/dev to the dev stage or dilbert-dev Serverless service. point dilbert.brianz.bz/api/qa to the qa stage or dilbert-qa Serverless service. point dilbert.brianz.bz/api/ to the production stage or dilbert-production service. You get the idea…this is a way to create different environments by pointing URLs at completely different systems. This process really can take a long time. While the message states “Up to 40 minutes” I’ve experienced wait times of several hours. 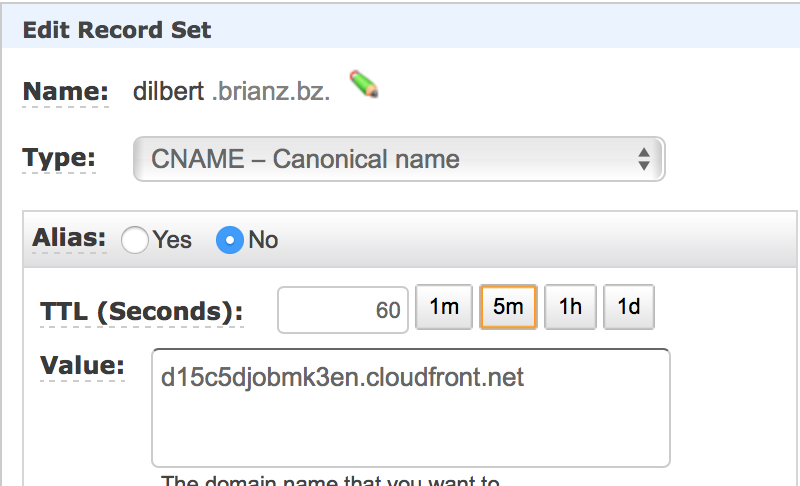 While you’re waiting on that to finishing there’s one final thing to do: add a CNAME record in your DNS zone file to point your public subdomain (dilbert.brianz.bz in this example) to the Cloudfront URL created on your behalf. Note, your DNS will likely propagate faster than the Cloudfront distribution takes to actually set up. After the wait is over and the Cloudfront distribution is created, we now have a perfectly valid SSL certificate which I can use for my API. Hitting https://dilbert.brianz.bz from Slack works as expected. certbot is a great tool to create perfectly valid and completely free ssl certificates. Creating these certs with the --manual method and the dns validation method is a simple way to get certs for use with API Gateway’s Custom Domain Name feature. Since these certs expire every three months you’ll need to renew a bit more often than with a paid SSL certificate, however the process isn’t that complicated and in my book the extra work is worth the price savings. Finally, I should note that certbot does not work with wildcard domains. If you have several subdomains you need certs for your only choice is to shell out the money for a wildcard domain from one of the commercial CAs.